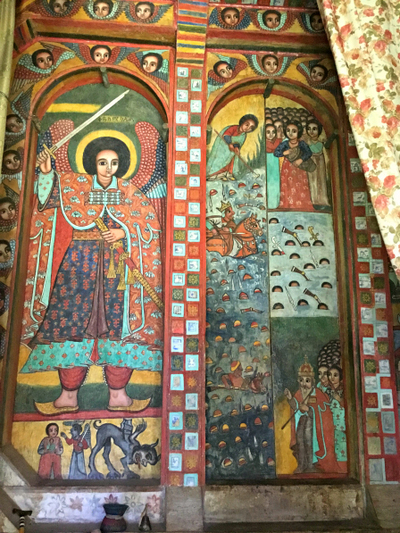 Behind the unassuming facade of Ethiopia's Narga Selassie church, located in the middle of Lake Tana, lies a trove of stunning religious paintings. Entering the Narga Selassie church in northwest Ethiopia is a bit jarring. The circular stone church, built in the mid-1700s, resembles the spare, thatched-roof homes many Ethiopians inhabit even today. It sits on grass worn by pilgrims' feet on an island in Lake Tana, the country's largest lake. It looks neglected. Inside, however, visitors find themselves in a different world: Narga Selassie's walls are covered with religious paintings illustrating Old and New Testament stories and a few saintly narratives. They are colorful, decorative, inventive, often idealized images with a folk-art quality. Although time has damaged some, and others have been repainted, they are astonishing. Ethiopia has been a Christian nation since the mid-fourth century, and its churches are famous—with the monolithic, rock-hewn churches in Lalibela that date to the 12th century being extraordinary engineering and architectural feats. 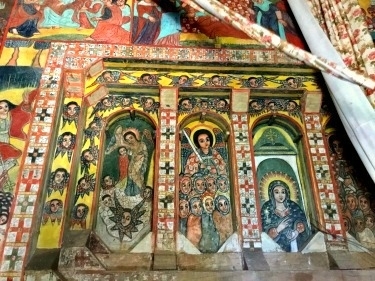 Narga Selassie is the best example of a different species of Ethiopian church, built centuries later on the peninsulas and islands of Lake Tana—with its reputation centered on its artistic splendor. An 18th-century queen named Mentewab built Narga Selassie, which is dedicated to the Holy Trinity, in gratitude to God. Raised on a plinth slightly above ground level, it consists of three parts. At the center sits a square inner sanctuary, or maqdas, reserved for priests, where is kept the tabot, or replica of the stone tablets citing the 10 Commandments that were given by God to Moses. The sanctuary is surrounded by a circular ambulatory, intended for use during services by those receiving communion. It, in turn, is encircled by an arched, open-air portico. The sanctuary, which is topped by a circular drum, is covered with paintings, nearly 100 all told, arranged in a loose grid. At the pinnacle of the sanctuary's north side, Christ is shown transfigured—dressed in a white robe embroidered with red flowers, his face illuminated by an orange halo, and surrounded by angels, Moses, Elijah and three apostles, all set against a brilliant yellow background. On the south side, the life of Mary is illustrated: She is a baby in the arms of her mother; a mother watching the Magi adore her child; a frightened wife fleeing with her husband and child into Egypt; a queen in heaven—and many points in between. On the east wall, beneath a depiction of Jesus ascending into heaven to the blare of trumpets and the beating of drums, many scenes focus on Christ's life and his miracles. The west side is the loveliest, probably because in Ethiopian tradition priests enter the church from the west, while other men use the north side and women the south. Here, the tripartite door shows, in the center panel, Moses leading the Jews from the desert and the Pharaoh and his men drowning, among other themes. Archangels, keeping watch with intent black eyes, their Afro hair surrounded by golden halos, dominate the side panels: On the left, St. Michael brandishes two swords; on the right, recalling a local legend, St. Raphael harpoons a big fish that was harassing a local town. To the right of the doors on this wall is the church's best-known painting: a beautiful, vividly colored (probably retouched) portrait of Mary and Child. She is serene, with big, almond-shaped brown eyes, dressed in a red robe and blue mantle covered with flowers. Like her, Jesus, held in her arms and holding a book, meets the viewer's gaze directly. A beautiful woman in fancy dress lies at their feet on her side. This is Queen Mentewab. 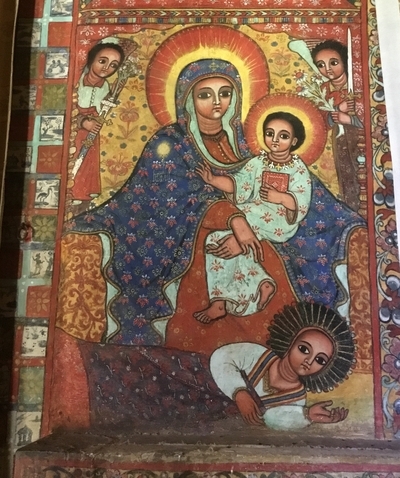 These are original works by anonymous painters, but they follow a type seen all over Ethiopia's churches. The round faces have the same stylized eyes. Most people face forward, or nearly so—anyone portrayed in profile is evil, as Herod is on the south wall as he orders the slaughter of the Holy Innocents. The charming cherubs that dot many paintings are just heads with wings. Presiding, on the west wall's drum, is the Holy Trinity as three elderly men, a common Ethiopian way of depicting this mystery of faith. They amaze. When I visited Narga Selassie last fall, a group of college students, all dressed respectfully in white robes, was there, having ridden a crowded ferry for three hours across Lake Tana to reach the church. Indelible in my memory is the sight of one young woman standing just outside the south entrance, her hands outstretched from her waist, in prayer. But even as she and others worshiped, a few could not resist interrupting their pilgrimage to take photographs.